It’s the first Wednesday of the month, so naturally, that means it’s time for another installation of our builder’s supplies and tools review series! This week, we’ve decided to shine the light on Roofing Superstore for all you insured roofers out there, and we’re dedicated to finding out a bit more about what they’re all about and – more importantly – what they have to offer you. Roofer’s insurance at a price you can afford with FREE legal expenses cover. Initially, we like the look of the website. It’s clearly organised and there’s a large range of categories to choose from, leaving you a little spoilt for choice! It seems to contain pretty much everything a roofer will need to complete a job – which means at least you’ll always be able to get everything you need for your work from one place, rather than hunting around multiple sites looking for the various components. We highly appreciate the feature in the top left corner of the homepage showing you the best lead prices for today, so you can see how good of a deal you’re getting when you place an order. 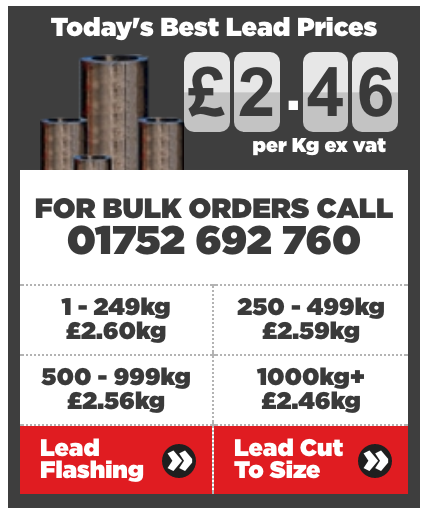 Lead is cut by weight and cost per KG depends on how much you’re going to purchase in total. If you need to call them, their office is open Monday to Friday 9pm – 5pm, so that’s a pretty standard affair. Quick questions can also be asked through their Zendesk Chat functionality at the bottom right-hand side of the window. 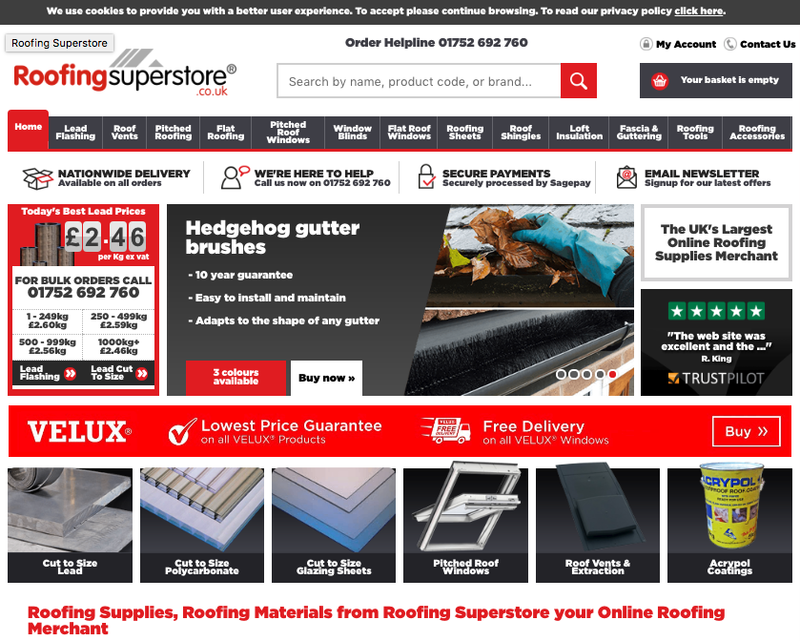 Roofing Superstore seems to be better suited to those who prefer ordering online, but it’s nice to know that if you do need help finding something, you can talk to someone if you need to. It’s also worth noting that they don’t have any stores, so you aren’t able to go in and look at products in the flesh, but in this day and age of technology when we’re all pretty adept at navigating the internet, that doesn’t seem to be such a deal-breaker as it might have been 10 years ago. Being an online store, their business model naturally relies on transporting goods and they apply charges based on size and weight of the orders. The products themselves are quite reasonably valued and could compete well with other suppliers in the sector. 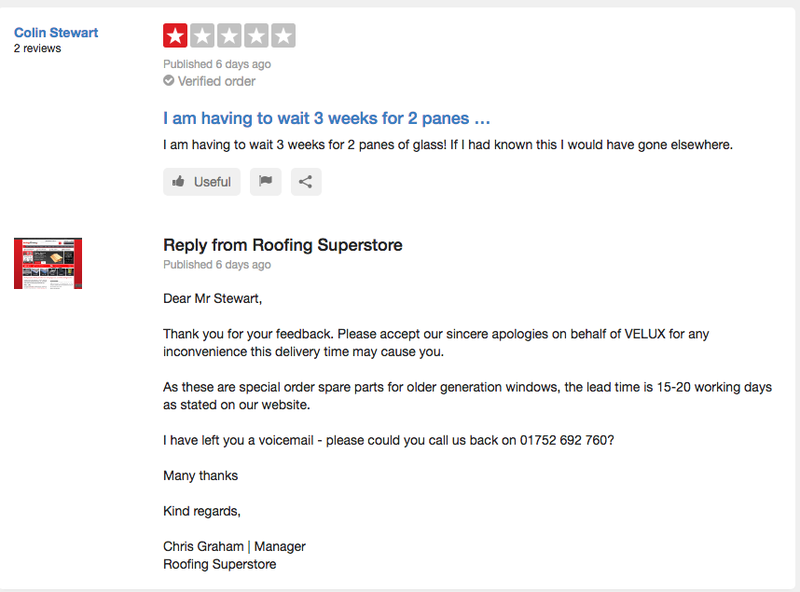 They do offer free delivery on all VELUX windows as well, which is pretty good if that’s something you’ll need to finish a job. One of the great features of Roofing Superstore is that they are able to not only take credit and debit cards through Sage Pay transaction facility, which offers high security, but also they also allow customers to pay through PayPal, which is commonly used by companies managing multiple payment accounts. The site is protected with an SSL certificate and used identity theft protection software from Security Metrics. Delivery time and costs are calculated upon order and take into consideration costs from manufacturer or distributor if sent out from there, or from courier if sent directly from Roofing Superstore. Orders made after midday are processed the next day, with exception of Friday where orders are processed on the following Monday. Trustpilot is one of the best review sites for companies offering supplies for the building trade, so if you score well here, you’re doing well. Roofing Superstore scores a glorious 5/5 from more than 7281 reviews, attaining ‘Excellent’ for their rating category. 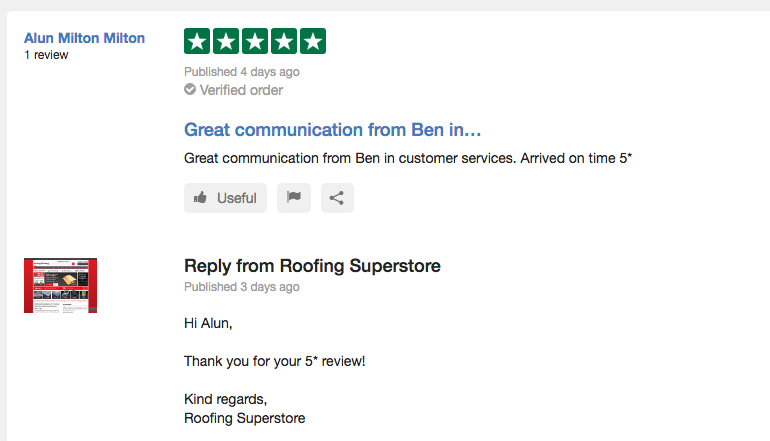 Apart from the occasional poor review, Roofing Superstore has racked up some very impressive reviews from their satisfied customers. You could be searching for a long time before you find another roofing supplier that receives the kind of praise that Roofing Superstore has accumulated. Like any good online merchant with a large number of customers, not all customers will be as pleased with their experience. Some of the notable reasons for their bad reviews (which are far rarer than the positive 5* reviews) revolve around sometimes slow delivery and bad delivery tracking, but this is often a result of the courier and/or manufacturer. 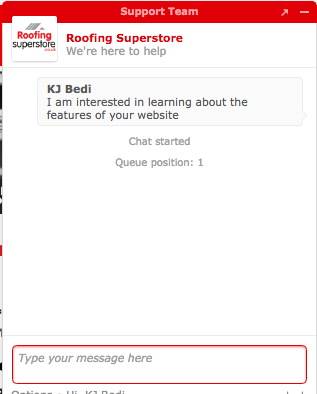 Since Roofing Superstore responds to every review, you’ll be able to understand where things went wrong in the customer’s experience. According to the website, the Directors have amassed over 25 years of expertise within the roofing supplies industry. What they seem to have achieved where others have failed is moving with technology changes and predicting that consumer demand is shifting to a fully online proposition. Roofing Superstore spends time getting as many products onto their website as possible, so that you don’t need to go into a store anymore. The website is nicely laid out and very thorough – and we’re even more impressed with the sheer range of products you can buy online. The customer reviews are exemplary and this is surely a testament to how well the company is being run. In this new age of technology, with more and more tradesmen becoming tech-savvy, Roofing Superstore is the way forward, bringing together the best of the worlds of online ordering and great customer service in perfect harmony. I am having horrible experience, because even after 5 working days the ordered items are not being delivered. When I call customer service they don’t have any information and just informs that item will be delivered. They are not giving any information as to when it will be delivered and whether it will be delivered. It seems they don’t have a clue as to what is happening because they have entrusted a third party to deliver the item and they are ordering the product from some other company. BEWARE!!! Ordered and received four velux Windows , 1000mm X 1600mm, to my own house, delivered on a pallet, were stored on my own drive until ready to use. Three weeks later, opened the first box and the unit was damaged, a crack through the inside of the plastic, opened the second one, exactly the same! Took the tops off the remaining two boxes,but did not take the windows out, both damaged the same. Sent three photos of each window in, showing the damage to all windows, after talking to his manager, I was told the next day that velux would not replace the Windows, I said that I had not bought the Windows from velux,but from yourselves, their answer was, we are not replacing them because you have had them too long. Make sure that you hold up the delivery driver until you have stripped your Windows from the pallet and taken everything out of the packaging and check them all carefully. This will slow down deliverys enormously, but you won’t get caught like me, with over £2,000 OF WINDOWS THAT ARE ALL DAMAGED. Worst customer service I have come across in 43 years in the building trade. crooks, they have your money and don’t give a toss, had I bought them from any of the merchants I use, there is no way that I would have paid for them, I’m sure that they would have been replaced. So by being tempted by the cheap price, I’m now £2k out of pocket.